This video shows the complete build of a Portable Rocket Mass Heater. This heater goes together like an erector set and comes apart just as easily. It’s custom mini mass. This heater can save you up to 80% on your heating bills. It is super efficient. This heater is beautiful and built completely from reclaimed and repurposed items. This rocket mass heater is Artistic one of a kind! 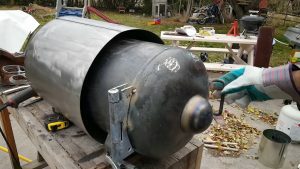 This rocket mass heater is made with air crete, and is budget friendly, handmade, and better than a wood stove.The advantage of this rocket mass heater is the huge increase in the efficiency of capturing and storing the available heat.